This week, Heidelberg University was once again among the top colleges and universities in U.S. News & World Report’s annual national survey, ranked at #58 in Regional Universities Midwest (up from #60 last year) and at #30 in Best Value Schools. “In recent years, Heidelberg has taken important steps to become more contemporary and more relevant for our students,” said President Rob Huntington. “We have sharpened our focus on the needs and priorities identified in our Academic Strategic Initiatives for Improvement Plan as we also continue to enhance our co-curricular and extra-curricular offerings and resources to ensure our students are successful. A combination of innovative, new programs – including the Four-Year Graduation Guarantee, new academic majors, minors and tracks, the HYPE Career Ready® Program and the PlusOne Advantage® Free MBA set Heidelberg apart and give students great opportunities and big advantages to prepare for successful careers and great lives lived purposefully and with distinction, Huntington said. Heidelberg was also recently ranked by College Consensus, a ranking website combining the latest results in the most respected college ranking systems with thousands of real student review scores from around the web to produce an aggregate score, as one of the 25 Best Colleges in Ohio. TIFFIN – For the sixth year, Heidelberg University’s School of Business, Computer Science and Information Technology will honor four local women entrepreneurs for their contributions to their businesses and the community. This year’s winners will be honored at a breakfast and award presentation ceremony, titled Celebrating Women Entrepreneurs, on Thursday, April 5. The recipient of this year’s Lifetime Achievement Award is Karen Klepper, a 1991 Heidelberg graduate who has served on a number of local boards and non-profits, including the Mercy Hospital Foundation, the Tiffin-Seneca United Way, the NOAH Foundation and PatchWorks House. Klepper is currently organizing a community collaborative non-profit, called ReClaim It, a resale shop whose proceeds will be used to improve the lives of local children and strengthen the systems upon which they depend. Kelli Dariano, the owner of Threads, will receive the Established Entrepreneur Award. Dariano opened Threads 19 years ago after working in sales and management in Chicago and Columbus. In its nearly two decades in operation, Threads has experienced 300 percent growth as it continues to bring the latest fashion trends in clothing and accessories to Tiffin. In 2009, Dariano, a John Carroll University graduate, also launched Club Thread, a loyalty club of customers that has raised more than $40,000 for charity. Heidelberg will present the New Entrepreneur Award to Zoe Dolch, owner of Washington Street Outfitters in the Laird Arcade. Dolch, a Tiffin native, Dolch received her advanced cosmetology license from Sentinel Career and Technology Center and her bachelor’s degree from Kent State in fashion merchandising. After returning to Tiffin, Dolch realized her dream of opening a business that offers a distinct product assortment, including men’s and women’s clothing, music, home goods and unique gifts and accessories. This year’s recipient of the Young Entrepreneur Award is 16-year-old Columbian High School student Maya Clouse-Henry. In addition to holding down part-time jobs at Behm and Henry Law Offices and Simply Susan’s, Clouse-Henry also operates her own T-shirt design business and her own photography business, MCH Photos. She also has been assisting Klepper in her efforts to get ReClaim It up and running. “Celebrating Women Entrepreneurs” is held annually in conjunction with Heidelberg’s spring Patricia Adams Lecture Series (PALS). This semester’s keynote speaker – publisher, educator and philanthropist Monica Lozano – will participate in the awards program. Attendance is by invitation-only. Improved, but not exactly new, the Berg Bistro 1850 has replaced the Fireside Cafe Pub on Heidelberg University’s campus. Located inside the University Commons, the Berg Bistro is part of the school’s new Parkhurst Dining options. The outdoor and indoor seating areas remain the same, keeping the same cozy, modern atmosphere with TV’s and a fireplace, but the restaurant revamped with an exciting new menu. Artisanal sandwiches, salads, soups, and gourmet flat breads are made with quality ingredients and from-scratch preparation. Hand-spun milkshakes and Crimson Cup coffee are now offered, and for those that don’t have time to sit down an expanded coffee bar and pastries provides a quick and delicious option. The Berg Bistro accepts cash, credit, and student Berg Bucks, making it not only a great place for students to hang out, but a restaurant everyone can enjoy. Events such as the monthly Pints with Professors, the weekly Coach’s radio broadcast, and trivia nights will still be hosted. Heidelberg University’s Master of Arts in Counseling (MAC) Program has received a four-year, $1.3 million grant to train counselors to fill gaps and unmet needs in Health Professional Shortage Areas (HPSA). 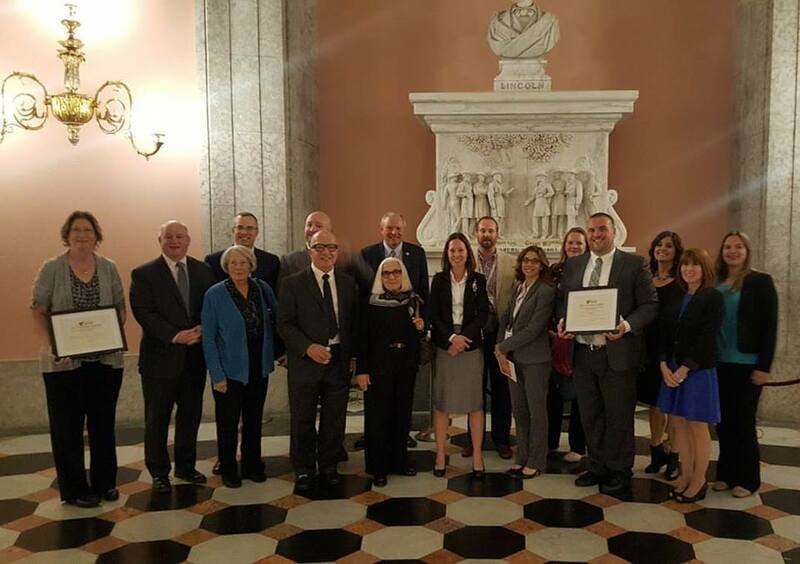 The grant, titled Project KITE, will target the rural counties of Erie, Huron, Seneca and Sandusky and three urban cities, Cleveland, Toledo and Columbus. Through the Behavioral Health Workforce Education and Training grant, graduate counseling students in their final internship will be eligible to receive a $10,000 scholarship during their field experience/internship. Working in interdisciplinary behavioral health care teams, the students will focus on providing trauma-informed care and substance abuse mental health services in rural and underserved areas throughout northwest Ohio. This is the second grant the graduate counseling program has received from the Health Resources & Services Administration as part of the U.S. Department of Health and Human Services. Last fall, the program received a $214,286 grant to assist in the training of counselors dealing with at-risk children. “What’s attractive about the grant is that it gives our students who are accepted into the scholarship program a $10,000 stipend to do their field experience as well as first-hand experience working with interdisciplinary teams in various agencies and schools,” said MAC Program Director Marjorie Shavers. The funding “opens up opportunities for our students and also speaks to the deficit we have in mental health providers” in the area. In all, 78 scholarships will be available over the four-year lifespan of the grant. Counselors trained through Heidelberg’s MAC program are being prepared to serve mental health clients with issues specifically related to the ever-growing drug epidemic, Shavers explained. “There are really strong demands for these behavioral healthcare personnel trained in comprehensive service delivery as the demand for services from models such as the Federally Qualified Health Centers (FQHC) continues to grow,” Lipford Sanders said. In addition to the student scholarships, Heidelberg will use the grant funding to recruit men and minorities into the MAC program, develop an interdisciplinary behavioral healthcare conference working with consultants from The Ohio State University, the University of Michigan and Arizona State University, and ongoing education for faculty and clinical supervisors. A full-time project coordinator will be hired to administer the grant. Heidelberg’s grant partners are the Sandusky City Schools, Mercy Health, the Neighborhood Health Association of Toledo and the Erie County Health Department. Founded in 1850, Heidelberg offers 30 majors, 30 minors and 10 pre-professional programs, awarding the bachelor of arts, bachelor of science, bachelor of music degrees, as well as master’s degrees in education, counseling, business administration and music. Heidelberg has been consistently ranked as one of the top colleges in the Midwest by U.S. News & World Report Magazine. For more information visit the web site at www.heidelberg.edu.